Burg Simpson’s injury attorneys are dedicated to helping injured individuals and their loved ones rebuild their lives and thrive after a serious accident or injury. Whether it’s a serious car accident that’s taken the life of a loved one or a dog bite that’s left you seriously injured, our injury law experts can help you secure compensation for the damages you suffered. We’ve handled almost every type of injury or wrongful death case, and have the resources, reputation, and a proven track record of success to assist you. Don’t suffer in silence. If you’ve been injured through someone’s negligence, recklessness or simple misconduct, visit a Denver injury attorney today. Few things are as unsettling and disruptive as getting hurt while on the job. You’re in pain, overwhelmed and full of questions. But you’re not alone. Thousands of workers get hurt on the job every year, and in Colorado, you don’t have to prove fault to claim workers’ compensation benefits. However, it’s a very complex process and area of law. Don’t make the mistake of trying to handle your own workers’ compensation claim and reach out to our injury attorneys for help. 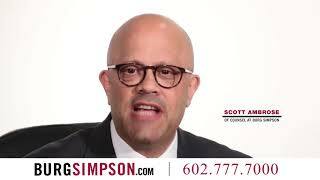 The Denver workers’ comp lawyers at Burg Simpson have the unique skills, extensive experience, and vast resources to help you get through this tough experience. We’re here to help. Burg Simpson is a team of injury law experts that have been protecting the rights of individual homeowners and homeowner associations for decades. Construction defects are any flaws in either the design or the construction of a building. These deficiencies can lead to serious physical injuries and/or property damage. Other, less serious, defects can still cause damage to a homeowner in the form of lost use or diminished value of the property, not to mention additional costs involved any fixing any mistakes. 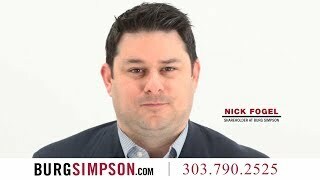 Burg Simpson is a group of nationally recognized injury attorneys out of Denver that has emerged as an industry leader in construction defect litigation. Medical malpractice arises when you’ve suffered an injury because of a medical provider’s behavior that deviates from a generally accepted standard of practice. These cases can be complex, expensive, and time consuming. They may take years to resolve. Because the evidence in medical malpractice cases are frequently difficult to understand, you need medical experts on your side in addition to our competent Colorado medical malpractice attorneys. That’s why we’ve assembled an experienced team consisting of our own nursing staff, as well as outside medical specialists, to review the facts of all of our medical malpractice cases. 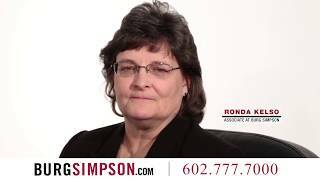 Aside from being Denver’s top injury attorneys, Burg Simpson handles a wide variety of business litigation matters. This area of law includes just about any kind of disagreement that arises within the confines of doing business. These can include contract disputes, business dissolution’s, consumer class actions, breach of fiduciary duty allegations, and product liability issues. Our experienced corporate lawyers and injury law experts are here to help you with your case whether you’re a multi-national corporation, partnership, limited liability company, sole proprietorship, family business, or even if you’re just an individual with an issue related to business law. No other country in the world uses as many prescription drugs or medical devices as the United States. Consumers have gotten used to having faith that when they follow their doctor’s orders by taking a prescription, the medication in question has been thoroughly tested and vetted. But because of either negligence by the manufacturer or a flawed regulatory approval process, this isn’t always the case. Burg Simpson’s injury attorneys of Denver have represented thousands of individuals who’ve suffered serious side effects after taking prescription drugs, or who’ve been injured as a result of a defective medical device. For more than 40 years, our 100-plus strong team of Denver mass tort lawyers, paralegals, and nurses have been assembled to lead high-profile litigation involving some of the world’s largest pharmaceutical companies. We’ve won favorable verdicts, settlements, and judgments on behalf of many of our clients.